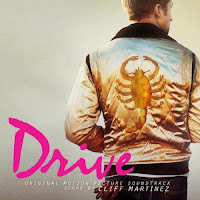 It's been a long time since a movie soundtrack encompassed everything set forth in a movie and the soundtrack to the movie Drive does just that. I don't know if this movie will be up for Oscar contention but I think it is hands down one of the best movies I've seen this year. I had an expectation of what I thought the movie would be about and I was totally wrong in the best way possible. The movie is gritty and dirty with a Spaghetti Western type of feel. Ryan Gosling plays The Driver and like other protagonists from films of the genre, he is a man of few words but much more action. The album is both the soundtrack and the score in one disc. The first 5 tracks are the songs used through the movie and the remaining tracks are the score. Night Call (Kavinsky & Lovefoxxx) - This song starts off the album. It's slow and moody and sets the stage. The overall feeling of the tracks have a very late 70s, early 80s vibe to them that give the movie more of a bite and makes it more that what it was. Even The Driver's jacket has a very vintage feel to it that only a quilted jacket with a scorpion could do. This song is pretty synth heavy and if you listen to it late at night on your way to work, it can be pretty damn creepy. Under Your Spell (Desire) - The synth is still pretty heavy as it is throughout all the "songs" on the album. A heavy song about being caught up in someone's wake and being powerless to their magic. The vocals are dreamy and just kind of float along. One of my favorite of the 5 tracks. A Real Hero (College feat Electric Youth) - Each song just amps up the feel of nostalgia and the overall vintage quality keeps getting better. Cliff Martinez did an amazing job selecting the songs for this album and not only the placement in the movie but on the CD are amazing. They just take you through the film and because of the distinct quality of them, it is easy to place where they are in the movie. This song is as amazing as the others and I think this is probably my most favorite of them all. Again, the vocals are moody and melodic and have an overall dream like quality. Oh My Love (Riz Ortolani Feat. Katyna Ranieri) - This was apparently first in the 1971 movie Addio Zio Tom (Goodbye Uncle Tom) and was used amazingly in the movie. Tick of the Clock (Chromatics) - The last of the "songs" on the album. It's an instrumental track with a driving bassline that fits perfectly with the rest of the album.